“Villa des Orangers”, just steps from the Jemaa El Fna Square, close to the souks and the Royal Palace, is a superb Moroccan Riad nestled in the heart of the Medina of Marrakech. 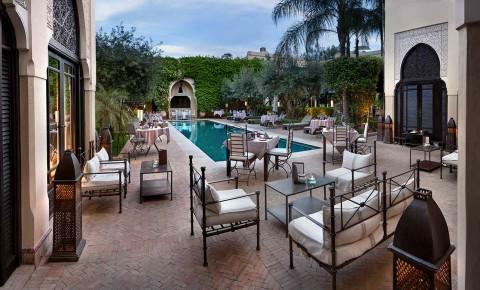 Built in authentic Moroccan style, it encircles an exotic, lush garden, complete with a series of elaborate arcade galleries that lead to expansive green patios and traditional fountains, a veritable oasis for the enchanted traveller. The manor’s elegant and refined Moroccan decor adds to the serene, restful ambience meant to soothe and bath the guest in a sea of iridescent colour and orange essence scents that pervade the atmosphere of this truly stunning structure. The rooms evoke a mystical harmony, fusing as it does Morocco’s rich, cultural heritage with the sublime modern pleasures of a first class luxury accommodations hotel. Guests can enjoy leisurely strolls through the fascinating grounds and interiors of this Riad or poolside, relaxing and sunbathing whilst admiring the fabulous view of the spectacular panorama and surrounding landscape. As magical evenings unfold, the inviting restaurant emanates its exquisite Mediterranean flavours and aromas, permeating the enchanting Moroccan night air. Extra beds Children: All children equal or under 12 years is charged € 85.00 per person per night when using extra beds. Beautiful suite of over 100m² on two levels, with a balcony overlooking the main pool and garden. On the 1st floor, without lift, a hallway with a walk-in wardrobe, an office area and a lounge with fireplace. On the second floor, the bedroom with a fireplace and balcony, walk-in wardrobe and bathroom with natural skylight, two washbasins, separate bath and shower, hairdryer. Double bed or twin beds (upon request when booking), satellite TV, Idock, DVD player, air conditioning, minibar, safe, direct dial telephone. His Opinion: Un très grand merci à monsieur Jean Paul et tout le personnel pour leur aide assistance et gentillesse. His Opinion: sehr individuell, relaxed, sehr empfehlenswert! His Opinion: Nous avons passé un séjour magnifique entouré de personnes très agréables et à notre écoute. 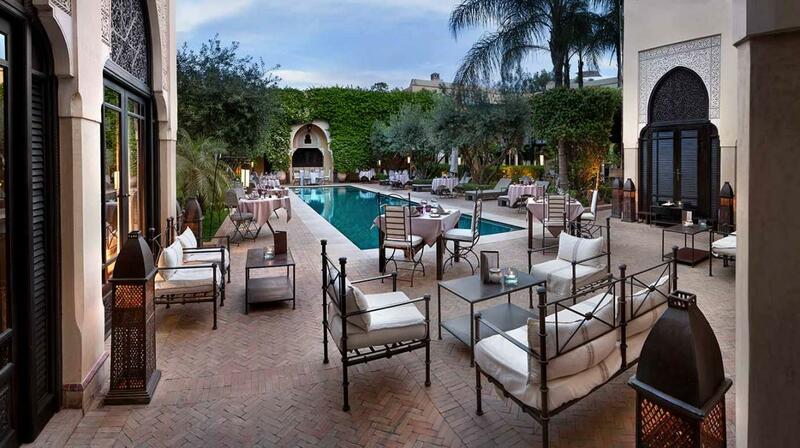 Ce riad est splendide !